The “Crusher” features unrelenting dirt climbs that reach dizzying altitudes. This is the men's climb from the 2014 Crusher in the Tushar. Photo by Catherine Fegan Kim/Cotton Sox Photography. Salt Lake City – Registration for the fifth annual Beaver County Travel “Crusher in the Tushar” – a race that event director Burke Swindlehurst describes as a “mixed-surface smorgasbord” – opens Wednesday, Jan. 7, 2015 at 7 p.m. MST. The “Crusher” has quickly gained notoriety within both road and dirt circles for testing cyclists of all abilities on an ultra-challenging course. 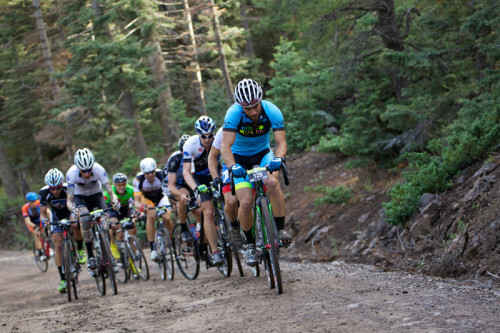 The 70-mile race on Saturday, July 11, 2015 traverses both paved and dirt fire roads on its way from the small southern Utah town of Beaver to the Eagle Point ski area. Making it all the more difficult are long climbs gaining more than 10,000 feet of elevation at altitudes nearing 11,000 feet. The past four editions of the race have attracted top names from professional road, mountain bike and cyclo-cross, including six-time Olympic medalist Clara Hughes, 2-time USPRO King of the Mountain Tyler Wren and decorated U.S. cyclo-cross riders such as Jamey Driscoll and 4-time U.S. National Champion, Jonathan Page. In addition to men and women's pro/open categories that compete for a combined $7,500 cash purse, the event also features 10 age-graded categories and a single speed category who compete for over $40,000 in sponsor prizes. The event is capped at 600 participants. Swindlehurst said he expects the event to again fill to capacity quickly, noting last year’s race sold out in under a week after registration opened. KUHL’s Joey Lythgoe savors the spoils of victory as the 2014 Crusher Pro Women’s champion. Photo by Catherine Fegan Kim/Cotton Sox Photography. On the women’s side, Park City’s Joey Lythgoe is expected to return in defense of her title in the Women’s pro category. “It’s been fun to watch Joey methodically make her way up the Crusher podium over the last 3 years. She’s really developed into one of the best female endurance riders in the country and she’ll be tough to beat,” said Swindlehurst. Additional information can be found at the event's website www.tusharcrusher.com.